The Hotel Alemannenhof is beautiful inside and out. 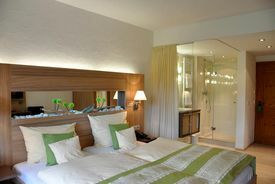 You have the choice between the breathtakingly beautiful Lake Titisee outside, and the comfortable hotel rooms inside, positioned fantastically on this beautiful lake! Black Forest style but without the clichés! 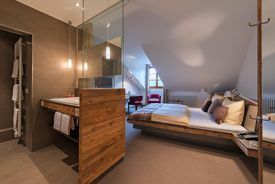 The Hotel Alemannenhof features cosy single and double rooms with 4 star comfort. 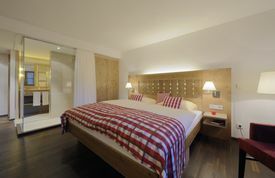 Our rooms are lovingly decorated in the typical style of the Black Forest, without any clichés. Here you will find the ideal place to come and rest and recharge your batteries. Start the day in the best possible way! 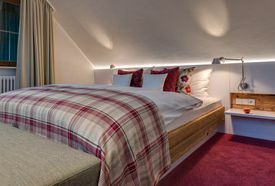 Simply have breakfast in bed in the Alemannenhof and enjoy with it the unforgettable views of Lake Titisee. With swimming pool, sauna or sunbathing lawn you can continue your day appropriately: relaxed, slowed down and completely happy!